Forecasters have warned of "extensive" thunderstorms and "torrential downpours" over north and mid Wales after temperatures soared. The Met Office said bouts of rain - heavy and thundery at times - could break out on Wednesday, including lightning and a chance of hail. It comes as Cardiff recorded its hottest June day in 22 years with temperatures hitting 31C (88F). Other places around Wales reached 30C (86F). 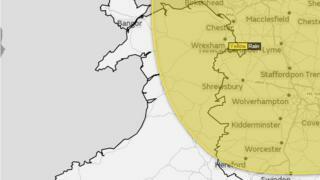 BBC Wales meteorologist Derek Brockway said among them were Porthmadog in Gwynedd and Llanfairfechan in Conwy county. Lansadwrn on Anglesey hit 29.4C, beating the previous high of 29.2C in 1992. The heatwave has seen five days of sizzling temperatures across the UK. A high of 34.4C was recorded at Heathrow on Wednesday, making it the country's hottest June day in 41 years. However, the weather is set to change, with a warning storms and heavy rain could lead to localised flooding and disruption to power supplies. The warning is in place from 03:00 BST on Wednesday until 06:00 on Thursday. But forecasters added many places would likely see little or no impact and parts of the warning area would see dry and sunny weather through most of Wednesday.